Welcome to the last AHIQ of 2018 (another year just flew by). In lieu of actual progress on The Shipping Forecast, I offer a quick review of my year's quilting. I'm not sure why but I have finished fewer tops this year than in previous ones. Here are the four that got done. Actually, if I pause and count on my fingers, I can think of about 5 weeks when, for one reason or another, I did no piecing - I guess that probably accounts for why there isn't an extra picture here. All of these are Modern Utility quilts by my definition, started with a bundle of recycled stuff and adding extra stuff from stash. Strangely, for the first time ever, I have more finished quilts than tops, so my backlog has actually decreased by a count of two, which can't be a bad thing. I have kept quilting steadily, though, except for two weeks in the summer. The thing I have enjoyed most about my quilting this year (apart from the count of finishes) has definitely been working with the recycled fabrics. I like the slightly softer quality that they bring to a quilt, enjoy the challenge of matching up bundles of shirting and then finding stash fabrics to add in. 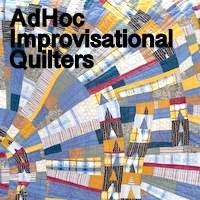 I have also loved the AHIQ challenges, which have resulted in quilts I don't think I would have made otherwise. I enjoy being given a (broad) brief and have found being able to follow other people's progress with the same challenge to be thought-provoking, eye-opening and inspiring. Looking ahead, I don't have many resolutions for 2018. There will be more AHIQ challenges to look forward to, so I'll take my lead from those, though I have a couple of things simmering away at the back of my mind that I hope to follow through. Having limited myself to recycled fabrics plus organic quilting cottons for the past two years it has become a habit that I can't see myself breaking, and which in fact gets easier to sustain the longer I do it. I'll probably keep going with my 'pile of shirts' approach for the most part, but there are also a couple of specific fabrics I would like to use, that may get to kick off their own quilts. We'll see. For someone who has developed the habit of resolutions (rather late in the day I discovered that I like them and they work for me) this seems distinctly low-key, but that's where I'm at right now. If I wake up on the first day of 2018 determined to recreate a Rembrandt in recycled denim or quilt my entire life story in 2" HSTs, I'll let you know! I'd like to thank everyone who has participated in AHIQ this year, by linking up, participating in the challenges, or simply taking the time to comment on the posts that are shared. Wow, you have reduced your pile! Congratulations! I sincerely hope that will be my outcome in 2018. I also notice that your four new flimsies are all lighter colours as well. Do you think that is just due to choosing more shirts, or is it a shift in your preference as well? In any case, it looks like a great year! I tried to link up too like Julie and found it to be closed but I'm linked at Ann's blog. I agree with you seeing others' work is both inspiring and thought provoking. Goodness you have achieved heaps this year!! One of my New Year resolutions is to make the time to work studiously on the AHIQ challenges and linkups! Better get organised!!! Ahh.. Kaja, your work is a constant source of inspiration to me! Love the gentle, soft look of your recycled fabrics. Am looking forward to the next years work! I also noticed how soft the colors are in the four quilts you finished this year. But some of the others have deep colors. Do you think you are moving into these soft colors for a while or is this part of using shirts? I visited a quilt shop this month that had several lines of organic cottons. I thought of you and bought some, too. Thank you for re-introducing me to recycled fabric. 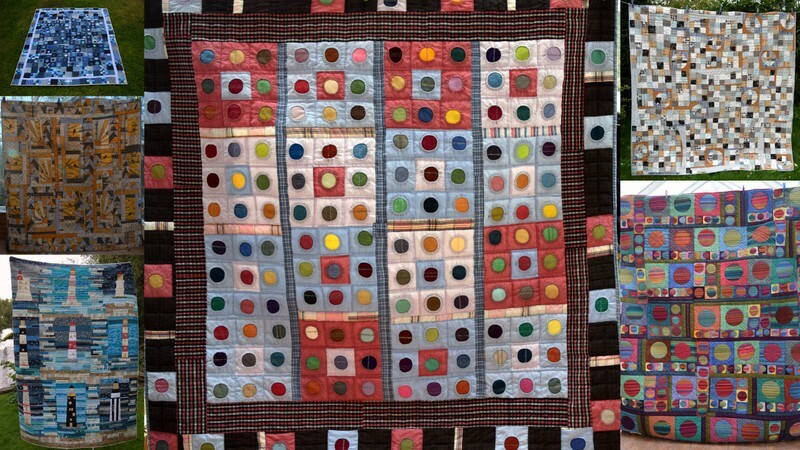 My first quilt was mostly recycled clothing but I've gotten away from it. The challenges have gone better than I expected. I think the broad, open-ended prompts have helped me most. Like you wrote, I especially like seeing how many different ways we all interpret those prompts. Where it leads us. How everyone combines them with their own views. I've come upon the whole ADHOC idea late in the journey. But, I have some shot cotton stripes, shiney dots, and 70's floral polyester from my grandmother's Hawaiian robe that I'm anxious to combine in some way. I look forward to our first challenge of the year. I love seeing your year in review. Maybe I can actually link up in 2018. We'll see. I also enjoyed your year in review. In fact, I stole your idea and wrote my own. Turns out I've been making mostly little things. How did that happen and I didn't even realize it? I'm hoping to find a few challenges like the circle challenge that we did. Maybe AHIQ will be the thing! light houses! More fun and challengeing, Happy New Year! I missed linking up as I was away from the computer for 11 days. You did a great job with your finishes for 2017. I am looking forward to a challenge or two from you and Ann. wow, wish I had any time to join you. 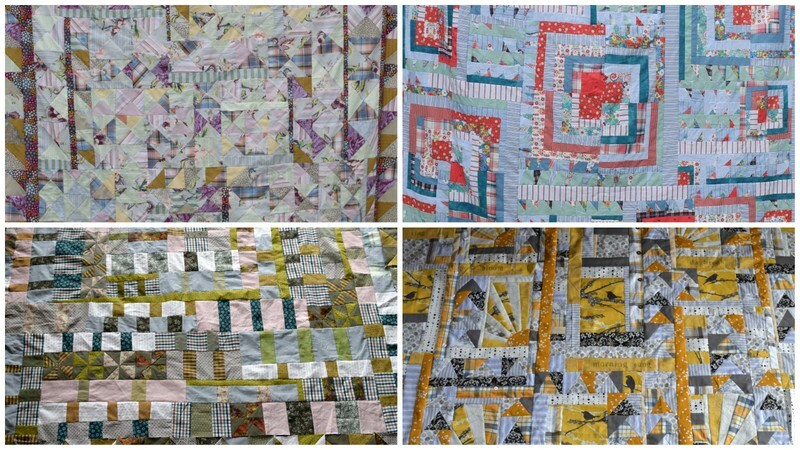 Love these quilters work and this site collaborating and all, great idea.Thanks for your continued inspiration!